The personalities of children are as beautiful and diverse as the different colors of the rainbow. Some kids are born with quiet and gentle spirits. They listen, eager to please their parents and earn their approval. They are shy, sweet, and will play quietly in their rooms for hours. On the opposite end of the spectrum are the kids who are a little more of a challenge to parent. From the moment they leave the womb, they move at a thousand miles an hour. They climb out of their cribs, choose to go on top of the slide, rather than down it, and seem hellbent on keeping their parents on their toes. These natural born rebels may be appear difficult, stubborn, or defiant, but in reality, their strong will is a sign of good things to come. Though it takes a little extra TLC from mom and dad, the willful child will grow up to impact the world in many ways. 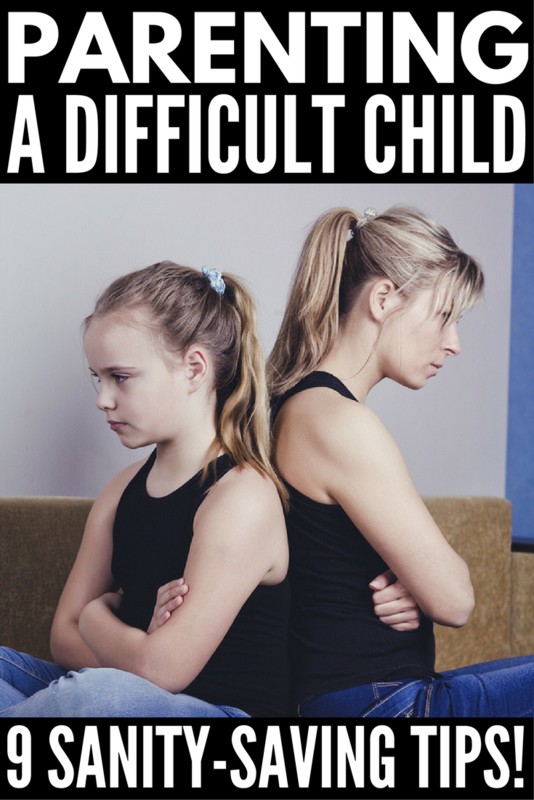 Parenting a difficult child can feel overwhelming! Here are 9 tips and tricks to help you tackle raising a strong-willed child. The expression “don’t make mountains out of molehills”, is especially true when raising a strong-willed child. They are independent by nature and like to do things a certain way. This can create tension between parent and child when they end up locked into a battle of wills. Power struggles usually end with no winner, and two losers. To keep yourself from falling into this trap, try not to make a big deal out of every issue. There are definitely times when you need to put your foot down, especially if a behavior or decision involves disrespect to parents or harm to the child. However, some issues are ultimately not worth arguing over. Stick to your guns, but don’t shoot yourself in the foot. Your strong-willed child will resent you as an authority figure if you constantly try to have control of everything they do. Their tendency is to buck when they feel the reigns getting too tight. Let loose by giving your child the chance to make some choices of their own from time to time. Allow them to choose an outfit of their own as long as it is appropriate for the outing, or choose what to eat at a restaurant. Letting your kid have some say in what happens to them is a good way to make them feel respected by you and more willing to listen to you when larger issues arise that they have no say in. Learning to do things for yourself is a healthy step in any child’s development. Allowing them age appropriate freedoms can help them feel like they are able to have some space from mom and dad and grow as individuals. Have them make their lunch or a small meal for themselves, or stay the night at a friends, providing you know the parents and feel comfortable. Doing things without mom and dad builds a child’s independence and ultimately their self-esteem as well. For the willful child, a strong sense of self is important. It can be difficult to see the future strong adult you are helping to raise while embedded in a power struggle. However, it helps if you realize that their stubborn nature and tenacity will ultimately be beneficial to them later in life. It is up to you to teach them to channel these behaviors in a productive way. The next time your child stands their ground on a subject, have a discussion about why it’s good to stand up for what you believe in. Recognize and acknowledge their strong sense of self, but also teach them that they have to respect your authority as their parent. It will help in your day to day parenting if you see their tenacity and sometimes difficult spirit as a fierce, underlying strength that will ultimately help them get through the difficulties of life. The willful child thrives on routine and predictable order. One way to avoid blowups and disagreements is to have a schedule with routine activities that your child knows they can count on. For example, they should know that every day when they get home, they must first do their school work before they can play, etc. When life throws a monkey wrench into your schedule and plans change, use it as an opportunity to explain how it is important to be able to adapt to all of life’s unpredictability. You may think you are doing your child a service by going easy on them. In reality, the strong-willed child thrives in a system of predictable order. If they feel that sometimes they can get away with things and parents will not step in and enforce consequences, it can leave them feeling insecure and unsure of their role and place in the family. Remove that feeling by having unwavering consequences and steps that you follow when order is not maintained or when negative behaviors arise. Let your kid know who the boss is by stepping in when they behave in a way they know they should not. One such consequence could be loss of privileges if a bad day is had at school. It may be hard to enforce such a consequence in the moment, but it helps your child learn that their actions have consequences, and helps them learn how to avoid dealing with the same consequences in the future. Sometimes behavior issues arise when our kids feel like they need more attention from us. Carve out time every day to show your little ones how much you love them. When they talk to you, give them your full, focused attention. Turn aside from what you’re working on and make eye contact. Seek to empathize and understand how they are feeling in any given moment. When you have a willful child, you can have a tendency to not always feel in control. Their strong personalities and desire to have their way make it seem like life is a constant power struggle. It is in these moments that you have to give yourself a time out. Count to three and take a deep breath. No matter what your child says, remember that you are the parent. You have the authority. Your child’s life would end without your every care, and loving support and guidance. Don’t get locked into a power struggle. Don’t always rush to say no, just to stay in a position of power. Occasionally say yes to things that are not a big deal, or a large strain on you to provide. Seek to steer their strong spirit into creative pursuits and activities, rather than squashing it with your authoritative power as their parent. While you have to stay in control, you lose your power when you lose your temper. Nothing helps a feisty, strong-willed child like the healthy outlet of physical fitness. This can be especially beneficial if you all participate as a family! Get together and go for a walk, a jog, or play a sport together. A tired child is much less likely to put up a fight than one who has had all day to sit on the couch and plan her attack. Parenting a difficult child takes lots of hands on effort, patience, and mental toughness. It’s no easy task, but it’s one that is ultimately a huge gift. Here’s a list of great resources to help you stay in the game and raise the willful child. If you found these tips on how to deal with a difficult child helpful, please share this post on Pinterest! And if you’re looking for more parenting tips and tricks, please follow our Parenting board where we share all kinds of great advice we find on the daily! Jessie is a fun and fabulous freelance writer living in the beautiful state of South Carolina. She has a little boy who is her entire world and stays focused on her work and hobbies by fueling up on large amounts of coffee. If she's not working her day job at a non-profit, you can find her hanging out with her friends or family, attempting to play basketball with her son, or working on one of her numerous side projects.